3) A spot on the extended version of the Ghost Children/Machines of God digital EP. 4) A recently unearthed CD copy of the original Ghost Children compilation, not available to the public for nearly 10 years! b) Songs from Other Eras: Covers of demos or live tracks released from this era that appeared on releases after Pisces Iscariot are not permitted. For example, even though "Set the Ray To Jerry" was recorded as a demo during the Siamese Dream era, it was later recorded and released as a b-side during the Mellon Collie era and therefore is not allowed. Also, it should go without saying that covers of "Bullet with Butterfly Wings" are not allowed, even though an early live version was performed in 1994. Furthermore, any other songs off the early Mellon Collie Demos in 1994 are not allowed either. c) Side Projects: Any songs written and recorded only for side projects and solo ventures are not permitted. In other words, please do not submit covers of songs by JP and the Cats, The Marked, Coat of Eyes, Snaketrain, and later side projects like Starchildren. Of course, if a song ended up as a Pumpkins song later, that's fine as long as they were released as SP songs between 1988 and 1994.
d) Song Preference: Please note that preference may be given to tracks that have not previously appeared on Ghost Children and Ghost Children 2, especially for the ‘Best Cover Song’ Selection. Songs that have appeared on previous releases include "Not Worth Asking", "Siva", "Rhinoceros", "Crush", "Starla", "Drown", "Moleasskiss", "Today", "Disarm", "Geek USA", and "Mayonaise". However, you are still permitted to cover these songs, but it is recommended that you try to record a different cover. e) Additional Excluded Songs: Since "Soma" already appears on the original version of the Ghost Children/Machines of God digital EP, please do not submit a cover for that song. It will not be eligible to appear on the updated version of the EP. We do not want to have two covers of the same track on the same release. f) Number of Songs Allowed: While you may record as many covers as you like, you are only allowed to submit one song for the contest. So we recommend you put as much effort as you can into the one song you plan to submit. As they say, put your best foot forward! 2) Definition of ‘Cover’ Song: A cover song for the purposes of this contest constitutes your own unique rendition of a Smashing Pumpkins song from this era (see above rules)-anything from a straight forward cover to a completely new take on a song is permitted. If you submit a track involving you singing or playing along to the original Pumpkins version of a song, your entry will be disqualified and it will not be posted on the site. Your track will also be disqualified if you submit a video cover instead of an audio cover. Only one cover song is permitted per artist/band. 3)Recording Quality: While you are not required to go into a studio to record your cover song, the quality of track should be comparable to tracks that appear on Ghost Children 2/Friends and Enemies, whether it's a good home demo or something you professionally recorded. Please ensure that your demo is clear and audible. 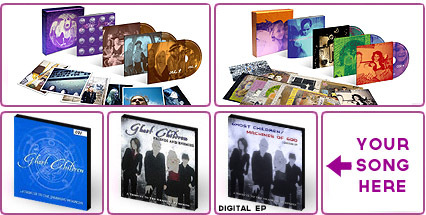 If your cover is selected to be on the extended version of the Ghost Children/Machines of God digital EP, please submit a lossless version (ie a wav file) to us in addition to the mp3 you've uploaded for the contest. This gives us greater flexibility in the formatting of the release. Also, you never know if we may want to use your cover for a future release. 4) Download/Streaming of contest submissions: For the duration of the contest, please do not make your cover available for download on your website, Facebook, MySpace, Twitter, Youtube, message board, mailing list or other fan outlet. In the event your cover is selected for inclusion on the digital EP, it would act as a free incentive for people to purchase the Ghost Children 2/Friends and Enemies charity compilation. If your track is made freely available elsewhere, people will have less incentive to purchase Ghost Children 2 and in turn, less funds will be raised for the Make-A-Wish Foundation. a) Airplay/Getting Your Music Featured: In addition to promoting the contest through your own websites, you are encouraged to contact our sponsor, Nameless Entity Media to explore the possibility of getting your cover played on air, your own original music featured, and maybe even getting interviewed by one of their DJs! 6) Submission Deadline: The deadline for entries is tentatively set for February 21, 2012. 7) Start of Voting/Announcement of Winners: Voting will commence following the submission deadline, which is tentatively set for February 21, 2012. Voting will run till March 16, 2012, with winners currently scheduled to be announced on Billy Corgan’s birthday, March 17, 2012. 8) ‘Best Cover Song’ Selection: After the submission deadline has passed, a selection committee made up of representatives from across the SP Fan Online Community will vote for the ‘Best Cover Song’ through private communications between selection committee members. Once all votes are in, the votes will be tallied and a winner will be determined. The ‘Best Cover’ song will earn a spot on the extended version of the Ghost Children/Machines of God digital EP along with some SP related merch (see Prizes). 9) ‘Fan Favorite Cover’ Selection: After the submission deadline has passed, ALL SP FANS will be invited to vote for their favorite cover from in a special poll on the contest page @ ThePumpkins.net. Only one vote per IP will be permitted. As with the ‘Best Cover Song’, once all votes are in, the votes will be tallied and a winner will be determined. The ‘Fan Favorite Cover’ song will earn a spot on the extended version of the Ghost Children/Machines of God digital EP along with some SP related merch (see Prizes). a) Alternate Voting Method: As an alternative to voting in the poll at ThePumpkins.net, you may also vote for your favorite cover when you purchase a copy of Ghost Children 2. You may vote either in the ‘comments’ section when purchasing through Paypal or by replying to your payment receipt indicating who you are voting for. Please note, you should list the artist and what the song they covered (eg. Death Rawk Boy – Today). 10) Tie-breakers: In the event of a tie, a sudden death round of voting will commence between the artists with the most votes for 24 hours. Also, if it turns out that both the ‘Fan Favorite Cover’ and the ‘Best Cover Song’ are the same artist/cover, then the ‘Fan Favorite Cover’ will be awarded to the artist/band with the second highest vote count. We will acknowledge the achievement if an artist happens to initially gets the most votes for both selections. But in the interests of fairness, we will be awarding the prizes to two separate winners.